Il Frantoio's "special caffè freddo"
Pg. 86 This was the first Harissa recipe I've made, much less tasted on its own. Not entirely sure how it's supposed to taste on its, but following the recipe exactly gave a spice blend that was equally "hot" because of the garlic and deeply peppery. Pretty simple to make. I'm done with this batch I'll try some others out to see how they stack, and perhaps adjust my rating then. Greek yogurt is mixed with chopped dried apricots, a bit of garlic (I used half a clove grated through the microplane) and salt. I made a half recipe with a cup of Total full fat yogurt. 2% could no doubt be used as well. MRS suggests that this dip be used to enhance grilled meats, as a sauce for rice pilaf, or to be served with flatbread as part of a mezze. I served it with lamb chops and the eggplant pilaf on p. 327. I thought it was a bit too dominant in both those contexts, though I do think it could make a nice enhancement to a plainer pilaf (or a stronger tasting lamb -- my nz loin chops were pretty mild). O did not like this dip (the apricot-garlic-salt combo was just too much for him) but E loved it, especially when mixed with the rice. I liked it but, as I said, I'm not sure I liked the pairings. I think I would like it best served as one of multiple dips for flatbread. We loved this. Beets are roasted in their skins, then peeled, sliced, and tossed in a viniagrette consisting of red wine or sherry vinegar (I did some of each), a bit of balsamic vinegar, a mashed garlic clove (I grated on microplane), s&p and olive oil. Separately, the greens are stemmed, blanched, then tossed with lemon juice, s&p and olive oil. She instructs to place the greens on a platter and top with the beets, but I served the beets in a bowl, surrounded by the greens. The salad as a whole was good but the truly delicious part was the beets with viniagrette. All I can say is YUM. The mix of vinegars, the bit of garlic -- it is perfect with the beets. The greens were fine, but I have other uses for them that I prefer, so in future I will skip that part of the recipe and make just the beets. This was delicious. As we are in the depths of winter, I left out the tomato and red pepper, but otherwise followed the recipe. We loved it. Will surely revisit during summer heatwaves as this recipe requires no cooking other than a minute in the microwave. ETA: I've now made this recipe several times. Last night I made it with the tomatoes and peppers for the first time. I liked these additions but prep time grew exponentially with all the extra chopping, taking it out of the quick weeknight category. I've made these simple marinated carrots twice. They're really good. Be careful not to overcook when steaming. optional: garlic Indeed, for people who don't like cooked carrots, these lightly marinated ones are great! Used skinny farmer's market carrots. Make again. Added some chopped Kalamata olives and green olives, as well a a little basil, but it was good even before these additions. Very quick and easy to make, and keeps well. page 101. Recipe states you can use mint or dill, not just mint. Pg 106 4 stars. Holy garlic Batman! Don't know if my garlic was particularly pungent or if I used two larger-than-average cloves, but this tzatziki is more garlicky than others I've had. This is certainly not a bad thing - I LOVE me some garlic. I used a really good Greek yogurt instead of drained yogurt, and did 2Tbs dill in one batch and 2TBs mint in the other.Salting, rinsing, and squeezing the water out of the cucumbers made for a really awesome texture. This may become my go-to Tzatziki sauce in the future! Well, this is just the quickest, easiest eggplant dish ever. I had a regular eggplant, sliced it into rounds, brushed with olive oil and popped it on the grill. A couple minutes each side and they were done. These had a wonderful texture, I almost want to describe them as pancake-like. The mint makes a big difference, and I think it's funny that it's not in the title of the dish. Delicious! Leftovers for lunch today were not too bad either! I elected to make this last night based on the fact that it looked like one of the simplest eggplant recipes in the book! I had two largish Italian eggplants that I sliced into rounds. Lacking a grill, I roasted them in a hot oven. My eggplant slices looked a bit dry coming out of the oven, but after steaming in a covered dish with a bit of extra olive oil, these were downright luscious! I added a sprinkle of Maldon sea salt along with the chile pepper and mint. We really enjoyed these flavors with the eggplant. While I'm sure they would have been even better if grilled, it didn't take long for two pounds of eggplant to disappear with nary a trace. Good dish. Made half a recipe and half of that was dinner on a hot, steamy night. It really hit the spot. I made it with an outstanding feta, Doldoni brand, that I bought at Costco, and Asian eggplants. This was the best way yet that I've found to enjoy this green. Purslane leaves are picked from the large stems (I left the small stems in) and mixed with a small cucumber, diced, and chopped kalamata olives. A viniagrette is made with lemon juice, red wine vinegar, crushed garlic, a bit of olive brine, s&p and olive oil. The ratio of olive oil to acid is quite low (3 tb acid to 1/2 cup of oil) and the dressing tasted off to me when tested on a leaf prior to tossing with the salad. However, once mixed with the purslane -- which is itself quite tart -- it was perfect. I had about twice as much dressing as I needed, though, so I'd make a half recipe of the dressing next time. These made a very nice appetizer, one of the best and easiest marinated mushroom recipes. The mushrooms shrink a lot, so one and a half pounds is not too much. They were good cold the next day, too. I just loved the big, fresh flavors of this salad, and with so many ingredients, there was something different and wonderful going on in every bite. The sumac really makes this salad. Also, since I ended up eating this as a main dish salad for dinner, I added a bit of crumbled feta halfway through to make it more substantial. That was excellent too. I didn't use the romaine - just a bit of purslane and some arugula. One note -- this salad makes a huge quantity! I made a half recipe which was a giant bowlful, enough for two people to eat as their main course. Not something you really need a recipe for exactly, but I made this recipe as part of a BBQ lunch and it was really good! p. 146 – If you’re looking for a recipe to clear out your CSA backlog or, to use up every last vegetable in your fridge…here it is! This is one of those recipes where substitutions will work really well. A word of warning, the recipe states a yield of 6 servings…that might be true if you were serving six hungry giants but if you have regular-sized folks on hand, I suspect you could feed 16-20. I made this in my 6.7 litre Le Creuset Dutch oven and it was full to the brim! Green veggies are blanched prior to adding though unless you’re in a hurry, this step isn’t really necessary. The author suggests that water be used but I had some nice chicken stock and chose to use that instead. The flavours of the dish were even more developed the next day and the overall dish was much heartier. Good thing we thoroughly enjoyed this as I suspect we have enough leftovers to sustain us clear through until springtime!! This was a tasty soup. I wanted to make it because for whatever strange reason I had all of the ingredients on hand, including part of a cabbage and a butternut squash and 1/2 cup of farro that needed using somehow. However, at the end of the day this was very similar to my regular minestrone (Tamar Adler's recipe) which is easier and doesn't dirty so many dishes. Not bad, but not great. This yielded more than the 6-8 servings the recipe indicates - more like 10 generous servings. I chose this recipe because I had everything in the house to make it - including the porcinis and parmesan rinds. I wouldn't recommend spending the $$ on 1 ounce of dried porcinis to make this recipe (make risotto instead!). That said, the recipe was rather easy, some chopping and sauteeing (plus soaking farro and porcini mushrooms), then it all cooks together for about an hour. We liked the chewy farro, but the flavor didn't live up to expectations (even after adding lots of salt and pepper). I expect we'll tire of it, so half is going in the freezer for future meals. I made a reduced version of this recipe for one with one clove of minced garlic to two cups of water. It was so delicious. But I need to get better at tempering the egg to avoid stringy whites. I made the zucchini variation, simply delicious! As promised by the headnotes, the ricotta gave the eggs a nice fluffy texture, and the creaminess of the mild cheese came through in the flavor as well. Just a tablespoon of chopped herbs really permeated the dish with a ton of flavor. My family loved this dish. I used her recipe proportions but my own frittata-cooking technique with good results. I love stratas, & the mushrooms & sage give this a comforting, earthy flavor. Unfortunately, there wasn't quite enough sage as called for, & I neglected to purchase Gruyere, so had to substitute cheddar. Still tasted good, however. The name says it all. Peeled chopped tomatoes are combined with the above ingredients, plus some chopped fresh parsley, olive oil, salt and pepper (though mine didn't need additional salt). Garlic is optional. I didn't use it, but I think it would be good. Also, I think this sauce would be just fine without the capers. The sauce is supposed to marinate for 30 min prior to being used, but I didn't have time for that. It was still good. I used chopped peeled romas and they weren't very juicy (probably because they didn't marinate) so I added extra olive oil, and extra basil as well. Nice summer pasta dish. Replaced the tomato sauce w Pomi sauce, added extra garlic & olive oil to compensate. Also extra olives. Probably used extra cauliflower as well but could have used even more. Served w parm rather than feta. 1/2 pound of pasta is enough with lots of cauliflower. Really liked this dish! One of the best cauli pastas I have made. This is essentially Pasta a la Norma, a traditional Italian dish of eggplant and tomato sauce. I took quite a few liberties with this recipe, and perhaps that's why it didn't blow me over. Essentially, chopped eggplant is sauteed in olive oil, then combined with the Southern Tomato Sauce (reviewed separately), grated cheese (I used parmesan) and fresh oregano (I subbed basil as there was no oregano in the market). I used penne instead of laganari. It was a good-enough dish, but I expected more. I think it needed more olive oil, and I wish the tomato sauce had more depth, or perhaps I would have preferred it made with fresh tomatoes instead of canned. I wouldn't repeat but will instead seek out other versions of this dish. Nice summer dish. My beans were some very over-the hill green beans from the depths of my vegetable drawer, which were disguised very well in this sauce. I used basil for my herb, and I elected not to add the balsamic vinegar because I didn't want to muddy up the lovely colors of my tomatoes. It was worth it to peel the tomatoes for flavor and texture. This amount of sauce would go better with 3/4 pound of pasta. So if making a full pound of pasta, I would add some extra tomatoes and cheese, and I would probably use plum tomatoes or else seed at least some of them to make the sauce a bit less watery. This is a very versatile recipe. Over the weekend I did another iteration substituting seared zucchini, diced small, for the beans. This time I added the balsamic and I think it was a good addition. She calls this a "grown-up style" mac and cheese. You make a tomato sauce (tomatoes, garlic, olive oil) and then mix it with goat cheese, basil, parmesan, and then macaroni and top with bread crumbs. I chose this recipe because I had some chevre that I needed to use up. This was a good dish, but not that different from the standard tomato/basil/cheese baked ziti dishes. My first time using yeast, I think. The crust was pretty straightforward and rolled out easily. I used half white flour and half whole wheat pastry flour. It wasn't hard like the greek crust. Still, I'm not sure I loved the flavor -- it was a bit plain. Maybe I just don't like olive oil crusts, or it could be my flour, or I need to keep trying different recipes, I dunno. This dough is very healthy, tasty considering how healthy it is, and comes together and rolls out very easily. I would have liked it to be a bit more tender, not sure whether it's the ingredient profile or possibly I kneaded too much or overbaked it. I've had my eye on this one for a while, but it didn't turn out to be my favorite combo of the tarts/gratins in this chapter. I only had half the amount of chard required, so subbed in some chard stems and scallion greens for extra vegetable matter. It's possible I would have liked the filling better if I made it as written, but I'm not sure. T and I loved this delicious winter pie, but sadly neither kid did. I used the greek pastry crust (ww variation) which came together easily. Wish my kids liked the gratins and pies from this book more, because personally I love them. A more saucy EP than I've made before, but it was really delicious. I made it with fairy eggplant and Pomi, but want to try it again with large eggplant and fresh tomatoes. This was an unexpected hit. I added a bit more cheese than called for. Perfect for a light fall dinner. This was excellent. I omitted the rice, which made for a much less hearty dish. I prefered the texture with the rice, and it also makes for better leftovers that way. These tarts are much improved by making at least several hours ahead -- try to do this from now on! Made with regular cauliflower and panko, and a bit of extra cheese on top. It was wonderful! We enjoyed this. It had a surprising amount of flavor and tasted "meaty" though it was vegetarian. With the rice, cheese and vegetables it made for a satisfying vegetarian main course without being overly heavy. I tasted the gratin 10 minutes out of the oven (the minimum resting time specified in the recipe) and an hour later when it was still just a bit warm, and I preferred it after it had been sitting for a while and was warm to room temperature. E loved it and O said he liked it but only ate two bites, I think T was lukewarm, he would probably prefer something heavier. Used rainbow chard. Made recipe up through the gratin part and served as a warm side dish. Surprisingly good. Good flavor combination. Ingredients tend to stay separate rather than being cohesive. Delicious dish. Unfortunately my two little ones both refused to eat it, but my husband and I liked it a lot and had no trouble polishing it off. This was especially good after it had been sitting a while and was only lukewarm -- the vinegar had a chance to mellow with the tomatoes to produce a nice sweet and sour sauce. I used mint and parsley for my herbs and about 1 T vinegar. I didn't love this. The taste of wine was overpowering. Used this as a side dish for roasted chicken. Tender potatoes, garlicky; used frozen garden Italian green beans, which worked quite well, although texture would be improved with fresh green beans. This will be a good dish when the beans come in this summer. Didn't have time to hard-cook eggs, but will add that to the leftovers. Very simple but quite good. Next time up the rosemary. I made a half recipe including the optional green beans and okra. I enjoyed the dish well enough but it wasn't a repeater (too many ratatouille recipes to try, and I only get to do one or two a year). We really liked the soup. The broth is delicious. Haven't tried the gratin. Two stars for original recipe, four stars for gratin variation. Very good. I made this with dried black-eyed peas, but I think it would work just as well with fresh or frozen, though the cooking time might be a little shorter. I used more garlic and I used a bulb of Florence fennel, rather than just the fronds. I made a half recipe with a 16 oz package of frozen black-eyed peas, using up fennel fronds and stalks. It was very quick with the frozen peas, and I thought the flavor was excellent. She says the flavor is better the next day, but with the frozen peas I thought the dish was best when freshly made, when the garlic and fennel flavors were brighter. I would do this again, as I am always looking for more ways to make use of fennel fronds. I was unsure reading this recipe whether I would like it or not, and as it turned out it wasn't my fave. The sweet-sour element and the dill were a bit overpowering. Made this with just oyster mushrooms and dried porcinis. A really good risotto. Delicious. Interesting technique of cooking down the squash, then removing some from the pan and adding back only at the end, after the rice has cooked. I used basil, added near the end, instead of the marjoram. Very good. Made with one cup of rice, one zucchini and three tomatoes (what I had available) and there were hardly any leftovers. Good adapted as a pilaf with long grain rice. I really loved the flavors of this rice. Very gentle, warm and soft background notes from the garlic, onion and tomatoes, but then you would get exciting flavor pops from the whole spices scattered throughout. It also worked well with the soft roasted eggplant stirred in. This dish was perfect as a side dish for oven-roasted lamb. As a vegetarian main, serve with yogurt or a light tzatziki. I was cleaning out the fridge so used the listed ingredients in my own proportions according to what I had on hand. It was delicious and my kids loved it. Pg. 340 Definitely not a weeknight dinner unless you've done some of the prep work ahead of time (deseeding, peeling, cubing a winter squash) or have ready-made harissa on hand (the dried peppers listed in the recipe are for making harissa from scratch, which I did). The initial sweetness was shocking when I first tasted it 20 minutes into cooking. The sweetness mellows out with the addition of 1-2 TBS of harissa along with the parsley towards the end of cooking. I used a "calabaza" because the market didn't have any butternut squash, and it melted into the stew, providing a nice thickness to it. Don't know if that would happen with butternut squash. The flavor profile took some getting used to, but I'm quite fond of it now. I'm undecided if I will make it again purely because I'm not the quickest at dissecting a winter squash, and because I would likely be the only one eating it. I used equal parts of green figs and black figs. The recipe is a little fussy. Big bowl, small bowl, medium bowl, strainer, pot, storage container, etc. I had to read and reread to figure out what went where. But it's a nice one. I like a custard ice cream, and, along with the egg yolks, this one is made with milk, not cream, and only 1/3 cup sugar. So the sweetness and the flavor really comes from the figs. The only alteration I made was to substitute Domaine de Canton for the 3 tablespoons of wine or water called for, and I also added a good dash of it as the ice cream was processing. Yum. I'm warming up to this book. This clafouti is wonderful. The apricot halves are a bit hard to cut through when eating, though, so I think I'll slice the apricots next time. The online version is different than the one in the book Mediterranean Harvest. Intensely flavorful and inherently healthy, Mediterranean food is one of the world's most appealing cuisines. Mediterranean cooks know how to make eating a pleasure. They do it simply - with olive oil and garlic; with herbs and spices; with tomatoes and eggplants, peppers and squash, figs and peaches, and other seasonal produce. And of course there is crusty bread and local cheese, the freshest yogurt and endless wine. In this authoritative and anecdotal cookbook, award-winning author Martha Rose Shulman captures the vibrant flavors of the Mediterranean region in more than 500 delicious vegetarian dishes that will appeal to everyone. The book represents years of meticulous research gleaned from Shulman's travels through France, Spain, Italy, the Balkans, Greece, Turkey, North Africa, and the Middle East. She presents authentic recipes handed down from mother to daughter for generations, and she offers her own contemporary variations as well. You'll dine with her in Greek olive groves, feast on tomatoes and fresh sardines in Croatia, savor coffee gelato in the streets of Bologna. At every turn in the road there is a new culinary reward. 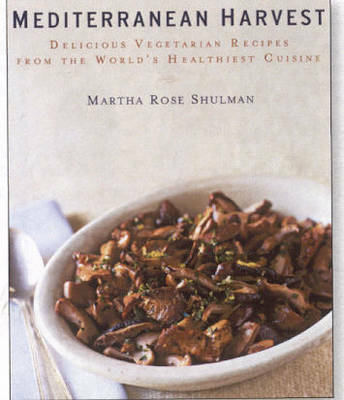 Whether you are a vegetarian or a dedicated meat eater, Shulman's recipes are substantial enough to satisfy any appetite. Included are such tempting creations as Majorcan Bread and Vegetable Soup, Provençal Chick Pea Salad, Pasta with Ligurian Artichoke Sauce, Greek Cauliflower Gratin with Feta and Olives, Balkan-Style Moussaka, North African Carrot Compote, and Sweet Dessert Couscous with Citrus and Pomegranate. There is also an entire chapter devoted to the renowned little foods of the Mediterranean: tapas from Spain, antipasti and merende from Italy; meze from the eastern and southern Mediterranean and more. In addition the book features a glossary of useful cookware and indispensable pantry staples and the best online sources for hard-to-find ingredients. As Martha Rose Shulman herself says "Mediterranean food enthralls me." Readers of this classic will be enthralled as well.